The only part of the AA1's exterior that we have doubts about are the touchpad and buttons. The buttons are placed on either side of the touchpad, which is all well and good from a space-saving point of view, but in everyday use we much prefer the more traditional placement below the pad - the place where you fingers' muscle memory expects them to be. The buttons are too small too. Exterior connections consist of three USB ports; 3.5mm headphone and microphone jacks; a VGA port; a 10/100Mb/s Ethernet port; and an SD slot. So far, so Eee. But the AA1 has a second memory card slot, and this is used in a very novel way. More on this later - continuing our tour around the AA1, flip up the lid and you come across a 8.9in, 1024 x 600, 262,000-colour, LED-backlit screen, and a rather decent example of the breed it is too. Bright, clear and well up to the task of watching full-screen movies if your AA1 will be doing duty as a PMP. Above the screen sits a 0.3-megapixel web cam and a digital microphone. Combine these with the two reasonable stereo speakers and you have an effective little communications device. 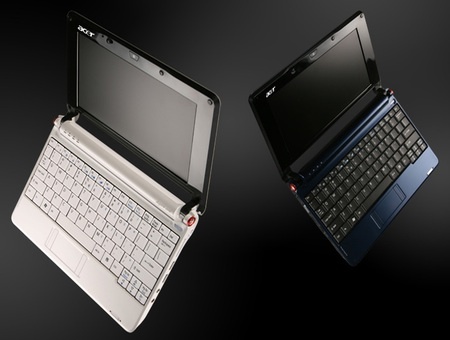 Under the hood, the AA1 is driven by Intel's 1.6GHz Atom N270, just like the Eee 901 and 1000, and the MSI Wind. It has 512MB of memory and a Intel 945GSE chipset which also provides the graphics. OK, not a spec to blow anyone's socks off, but good enough to cope with anything that should realistically be thrown at a netbook.